The confectioner rejected a lowball offer from Cadbury’s parent. Mondelez could pay $26 bln without hurting its shareholders or incurring excessive debt. The jubilant reaction from investors to the initial bid may tempt CEO Irene Rosenfeld to sweeten the terms of her offer. 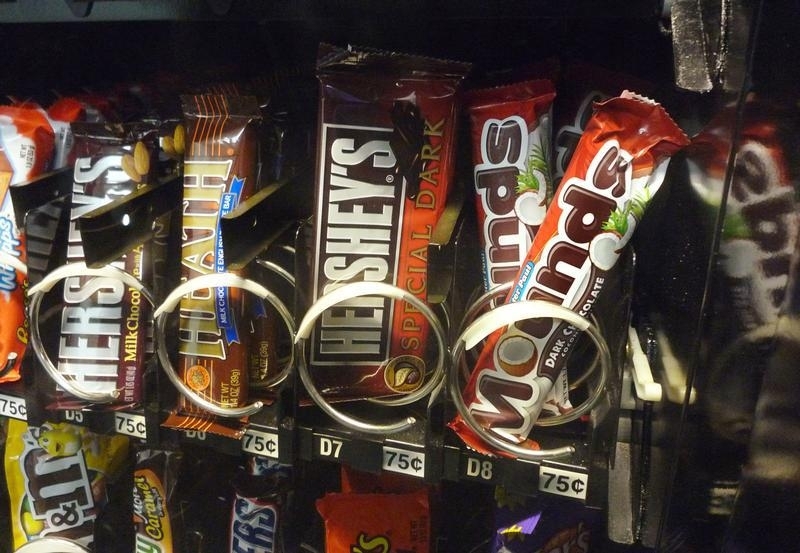 A row of candy bars manufactured by Hershey is seen in a vending machine in Washington June 17, 2008. Hershey rejected a takeover offer worth $23 billion, or $107 a share, in stock and cash from rival food conglomerate Mondelez International on June 30. Pennsylvania-based Hershey's shares rose more than 15 percent after the Wall Street Journal reported that Mondelez had sent a letter to the chocolate maker proposing a deal. Mondelez shares traded nearly 2 percent higher by midday in New York. Hershey is controlled by the Hershey Trust. The trust owns 8.4 percent of all stock, but controls 81 percent of the vote thanks to super-voting shares. The trust's board members oversee the Milton Hershey School, a private boarding school for at-risk children. The trust's chief compliance officer was put on administrative leave in early June after a memo of his leaked that said the board had spent $3.6 million to investigate alleged conflicts of interest and insider-trading accusations against board members. The Pennsylvania attorney general's office is seeking the resignation of three long-standing board members, according to a story published in May by the Philadelphia Inquirer. And in May, the trust fired John Estey, a top official, after he pled guilty to fraud.